How College Green could look if it were pedestrianised. DUBLIN CITY COUNCIL has confirmed that it will continue hearing from the public as the prospect of opening a completely pedestrianised College Green area hit a stumbling block. The extended consultation follows the submission of further information requested by An Bord Pleanála regarding the effects of the proposed development on the environment and the impact it would have on city traffic. The public process will start on 16 November for a three-week period. 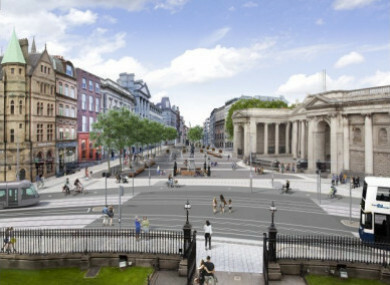 Dublin City Council is proposing to develop College Green as a pedestrian priority civic space. It is intended that it will be an “attractive tree-lined, granite paved 7,300 square metre space will facilitate major public gatherings and processional events through the city”, according to the council. DCC said that it will have the capacity to accommodate up to 15,000 people and will be fully equipped with the infrastructure required to stage large public events. But the council said that existing traffic arrangements in College Green will remain in place until the New Year. It said this will help facilitate Operation Open City which aims to keep public transport moving during the run up to Christmas. The existing restriction on taxis using lower Grafton Street in a northbound direction will remain in place. An Bord Pleanála specifically stated that it required more details about the “wider implications” of these plans to ban motor vehicles from the busy road and the effect this would have on traffic in the city as a whole. This information was supplied by DCC, and An Bord Pleanála has now ruled that interested parties need to be allowed time to review the ”significant additional data”. The council will be required to advertise the extra information and take on board further submissions from the public. Transport bodies such as Dublin Bus and the National Transport Authority (NTA) objected to the plan. Local business owners also said they were concerned that the plans could impact trade. Email “Dublin traffic restrictions to remain in place until New Year as College Green development plans stall”. Feedback on “Dublin traffic restrictions to remain in place until New Year as College Green development plans stall”.